Our Lady of Hope Roman Catholic Church in Manning is a modern church built in 2005. The congregation is a daughter church of historic St. Mary Roman Catholic Church in neighboring Summerton. 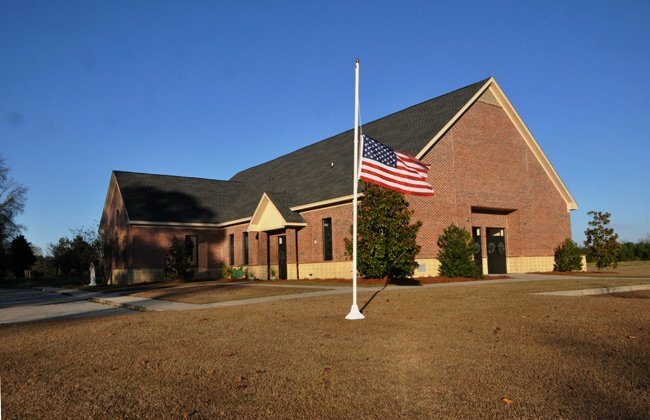 However, as the Catholic population of Summerton has dwindled over the years, as of 2014 St. Mary is now a mission church of Our Lady of Hope, a decision based on Manning’s more active Catholic community. St. Mary began in 1899 when Lebanese immigrants came to Summerton in search of employment and entrepreneurial endeavors. Being Catholic, the new residents had to travel to present-day St. Anne in Sumter to attend Mass. In turn, priests would sometimes travel to Summerton and perform services in family homes. By 1913 church members had purchased a plot of land for their own building, and in 1914 St. Mary’s Roman Catholic Church was constructed. In 1977 Herman Ridgill donated one acre of land in Manning to the Diocese of Charleston with the stipulation that it be used for the building of a Catholic Church. More land was donated by Mrs. Ridgill in 2000, bringing the total acreage to five. Catholics in Manning who weren’t traveling to other areas for Mass had been worshiping in Manning High School; the need for a local Catholic church was clear. Bishop Robert Joseph Baker, the 12th Bishop of the Diocese of Charleston, declared in 2003 that Manning would be home to a new Catholic church. Today Our Lady of Hope sits on 16 acres in Manning off Interstate 95 and is the church home to 200 families. This photo was taken on December 18, 2012. Photographer Chris Walsh tells us that the flag was lowered for the victims of the shooting at Sandy Hook Elementary School in Connecticut on December 14, 2012.